Hawkeye (Clinton Francis "Clint" Barton) is a fictional superhero appearing in American comic books published by Marvel Comics. Created by writer Stan Lee and artist Don Heck, the character first appeared as a villain in Tales of Suspense #57 (Sept. 1964) and later joined the Avengers in The Avengers #16 (May 1965). He has been a prominent member of the team ever since. He was also ranked at #44 on IGN's Top 100 Comic Book Heroes list. Hawkeye's first self-titled comic book and first appearance with Mockingbird on the cover of Hawkeye #1 (Sept. 1983). Art by Mark Gruenwald. Hawkeye is portrayed by Jeremy Renner in the Marvel Cinematic Universe, a shared fictional universe that is the setting of films produced by Marvel Studios. Renner first made an uncredited cameo appearance in Thor (2011) and later played a larger role in The Avengers (2012), Avengers: Age of Ultron (2015), Captain America: Civil War (2016) and Avengers: Endgame (2019). Hawkeye's first appearance on the cover of Tales of Suspense #57 (September 1964). Art by Don Heck. Hawkeye was introduced as a reluctant villain in Tales of Suspense #57 (September 1964). After two more appearances as a villain in Tales of Suspense #60 and #64 (December 1964 and April 1965), Hawkeye joins the ranks of the Avengers in Avengers #16 (May 1965). He became a perennial member of the team and has made numerous appearances in all five volumes (Vol. 1 (1963–1996), Vol. 2 (1997), Vol. 3 (1999–2004), Vol. 4 (2010–2013), Vol. 5 (2013–present)), including specials and annuals, as well as in The Ultimates. However, Hawkeye's presence in the Avengers - both the team and the series - would be sporadic for nearly a decade starting in early 1973. Steve Englehart, the Avengers writer at the time of Hawkeye's departure, explained, "When I had Hawkeye quit the Avengers, I liked him, but I wanted to try a different approach, so his leaving fit in with what I was trying to do." 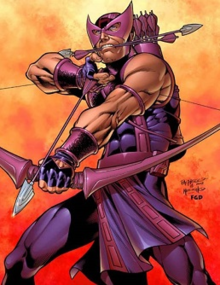 Hawkeye featured prominently in the limited series West Coast Avengers #1–4 (September 1984–December 1984) as founder and team leader, before appearing in the ongoing title, which ran for 102 issues (including eight annuals) from October 1985–January 1994. The title was renamed Avengers West Coast from #46 (Aug. 1989). Hawkeye also starred concurrently in almost every issue of Solo Avengers which ran for 40 issues from December 1987–January 1991 (the title was renamed Avengers Spotlight from #21, the August 1989 issue). From 1998 to 2002, Hawkeye featured significantly as team leader in issues #20–75 and Annual #2000 of the title Thunderbolts, written by Kurt Busiek and Fabian Nicieza. He appeared as a supporting character in Avengers Academy from issue #21 (Jan 2012) through its final issue #39 (Jan 2013) and as team leader in Secret Avengers from issue #22 (Feb 2012) through its final issue, #37 (Feb 2013). Hawkeye appeared in Vol. 2 (2013) of Secret Avengers by Nick Spencer and Luke Ross. Hawkeye appeared as a regular character in the 2010-2013 Secret Avengers series, from issue #21.1 (March 2012) through its final issue #37 (March 2013). Hawkeye featured in the Marvel crossover event House of M (2005). He later appeared (as Ronin) in the New Avengers series from issues #26–64 (2007–2010) plus New Avengers Annual #2 (2008) and Annual #3 (2010). Continuing as Ronin, the character played an important part in the crossover event Secret Invasion #1–8 (2008). The company wide crossover event Dark Reign saw Hawkeye feature prominently in New Avengers: The Reunion #1–4 (2009) and Dark Reign: The List - New Avengers #1 (2009). He later went on to feature in the Siege #1–4 (2010) crossover event. Hawkeye has appeared in numerous solo adventures over the years. He appeared in Hawkeye #1–4 (1983), written by Mark Gruenwald (which was the character's first encounter with Mockingbird and the villain Crossfire). Hawkeye then appeared in Hawkeye Vol.2 #1–4 (1994) and Hawkeye: Earth's Mightiest Marksman #1 (1998). In 2003, Hawkeye had a short lived on-going series, Hawkeye Vol. 3, #1–8, which was soon cancelled. Writer Jim McCann and artist David Lopez had another unsuccessful attempt at an ongoing series with Hawkeye & Mockingbird #1–6 (2010). The series did however spin into two limited series, beginning with Widowmaker #1–4 (2010–2011) and then Hawkeye: Blindspot #1–4 (2011). A fourth volume of Hawkeye began in August 2012 by the creative team of writer Matt Fraction and artist David Aja, which features a partnership with his protege, Kate Bishop, which was met with critical acclaim. As part of the All-New, All-Different Marvel relaunch, a new series entitled All-New Hawkeye began in March 2015, written by Jeff Lemire with art by Ramon Perez, which only lasted 5 issues, then a second volume which continued the previous story ended after 6 issues. Over the years, Hawkeye has made guest appearances in numerous Marvel titles, the most notable being Daredevil #99 (1973), Incredible Hulk #166 (1973), Marvel Team-Up #22 (1974), Ghost Rider #27 (1977), Marvel Team-Up #92 (1980), Marvel Fanfare #3 (1982), Captain America #317 (1986), Contest of Champions II #3-5 (1999), Fallen Son: The Death of Captain America #3 (2008), War Machine Vol.2 #8-10 (2009), Young Avengers Presents #6 (2008) and Captain America: Reborn #3-6 (2009–2010). Post Civil War II, Hawkeye will star in new solo series called Occupy Avengers written by David Walker and penciled by Carlos Pacheco. Kate Bishop had starred in the 5th Volume of Hawkeye. However, the book had been cancelled with its 16th and final issue in early 2018. Clint Barton was born in Waverly, Iowa. At a young age he lost both of his parents in a car accident. After six years in an orphanage, Clint and his brother Barney ran away to join the Carson Carnival of Travelling Wonders. Clint soon caught the eye of the Swordsman, who took the young boy on as his assistant. Along with the help of Trick Shot, the Swordsman trained Clint to become a master archer. Clint later found the Swordsman embezzling money from the carnival. Before he could turn his mentor over to the authorities, Clint was beaten and left for dead, allowing the Swordsman to escape town. Clint's relationship with his brother Barney and Trick Shot soon deteriorated as well. Clint adapted his archery skills to become a star carnival attraction, a master archer called "Hawkeye", otherwise known as "The World's Greatest Marksman". He spent some time as a member of Tiboldt's Circus, before joining the Coney Island Circus. He witnessed Iron Man in action and was inspired to become a costumed hero. However, after a misunderstanding on his first outing, Hawkeye was accused of theft and believed to be a criminal. On the run, the naive Hawkeye met the Black Widow, a spy for the Soviet Union, with whom he fell in love. Blindly following the Black Widow, Hawkeye aided her attempts to steal technology developed by Tony Stark. In one of their battles with Iron Man, the Black Widow was seriously injured. Hawkeye rescued her and fled the battle to save her life. But before Hawkeye could take her to a hospital, the Black Widow disappeared. Hawkeye decided to be a "straight-shooter" from then on. Hawkeye later rescues Edwin Jarvis and his mother from a mugger. In gratitude, Jarvis invites Hawkeye to Avengers Mansion and stages a confrontation to allow the archer to clear his name and gain the trust of the Avengers. Hawkeye is then sponsored by his former enemy Iron Man, who sees that he is serious about becoming a hero. Led by Captain America, Hawkeye joins the team along with Quicksilver and the Scarlet Witch to form the second incarnation of the Avengers. Almost straight away, Hawkeye clashes with his fellow Avengers. His romantic intentions towards the Scarlet Witch are met with hostility from her brother, Quicksilver. Hawkeye rebels against Captain America's leadership (due to his past problems with authority figures), but over time comes to respect him as a mentor and a friend. When the Swordsman attempted to join the Avengers, Hawkeye warned them of his previous history with the villain. Clint Barton sheds his Hawkeye identity to be the second Goliath on the cover of Avengers #63 (April 1969). Art by Gene Colan. Hawkeye enjoys many adventures with the Avengers and proves himself a hero on numerous occasions. However, when his bow breaks during a crucial moment in a battle, Clint decides to adopt a new costume and identity by succeeding Hank Pym as the new Goliath. Hawkeye (as Goliath) was later approached by his brother Barney, who had become a big-time racketeer. Barney had learned of Egghead's plans to construct an orbiting laser death-ray to extort money from the United States and came to the Avengers for help. The Avengers confronted Egghead and his allies, the Mad Thinker and the Puppet Master. Tragically, Barney died in the ensuing battle. (It was later revealed that Barney Barton was actually an undercover FBI agent.) Soon after this encounter, Egghead hires the Swordsman to capture Goliath (thinking him to be Hank Pym instead of Clint). Clint defeats and captures both criminals, finding justice for his brother at last. At the conclusion of the Kree-Skrull War Clint resumes the identity of Hawkeye with a new costume. After several adventures, Hawkeye quits the Avengers after a bitter rift with the Vision over the affections of the Scarlet Witch. Hawkeye returns to his original costume and strikes out on his own. For a time, Hawkeye drifts from one adventure to the next. He attempts to return to the Black Widow and briefly battles her current love, Daredevil. Hawkeye later assists the Hulk against the monster Zzzax. He then follows the Hulk back to the mansion of Doctor Strange, where after a skirmish, Hawkeye joins the "non-team" the Defenders for a short period. He returns briefly to the Avengers to attend the wedding of the Vision and the Scarlet Witch. Together with the Two-Gun Kid and Ghost Rider, Hawkeye defeats the monster the Manticore. Hawkeye returns to the Avengers when the current members of the team begin to mysteriously disappear. The remaining Avengers discover it to be the work of the Collector of the Elders of the Universe. After his teammates were all defeated, Hawkeye single-handedly defeats the Collector, and joins the team for the final battle against Korvac. Afterwards, Hawkeye's victory is dashed when the Avengers' new government liaison Henry Peter Gyrich, limits the roster and replaces him with the Falcon, in an attempt to make the team more "politically acceptable". After initially failing to find work in his civilian identity, Hawkeye gains employment with Cross Technological Enterprises as the Head of Security. He defends the company against the Shi'ar villain Deathbird, Mister Fear, and sabotages a plot by C.T.E. employee Ambrose Connors. Hawkeye then returns to Avengers mansion several months later for a brief visit "induced" by the heroine Moondragon before rejoining for a sustained period. Hawkeye returns to Carson Carnival of Travelling Wonders to aid Marcella Carson, the owner's daughter, against the Taskmaster. He defeats the villain with the help of Ant-Man. Later, Hawkeye inadvertently avenges the death of his brother. The villain Egghead, having been exposed for framing Henry Pym, attempts to shoot Pym but Hawkeye jams the barrel of the weapon with an arrow. The weapon is an energy pistol and explodes, killing Egghead instantly. Returning to work for Cross Technological Enterprises as Head of Security, Hawkeye meets the former S.H.I.E.L.D. agent Barbara "Bobbi" Morse, also known as the hero Mockingbird. Together, they discover that Crossfire, cousin of the company's original owner, was hatching a plot to destroy the superhero community via an aggression-inducing sonic weapon. Hawkeye and Mockingbird manage to defeat him (although Hawkeye is rendered 80% deaf when he uses a sonic arrow to counter Crossfire's weapon) and the two heroes get married shortly afterwards. At the direction of then-Avengers chair the Vision, Hawkeye (now using a hearing aid) and Mockingbird travel to Los Angeles to establish a west coast branch of the Avengers, known as the West Coast Avengers. While searching for a base of operations, Hawkeye and Mockingbird battle a vengeful Crossfire, who had recently broken out of prison. They manage to defeat the supervillain, aided by former actress Moira Brandon, who later allows her mansion to become the new Avengers Compound. On one of the West Coast Avengers adventures, when the team was lost in time, Mockingbird was kidnapped by an Old Western hero called Lincoln Slade, the Phantom Rider. The Phantom Rider drugs Mockingbird, convinces her that they are in love, and forces her to engage in a sexual relationship. Mockingbird soon regains her senses. In the resulting battle between the two, Mockingbird allows the Phantom Rider to fall to his death. Afterwards, when Mockingbird confesses what she did, Hawkeye is stunned that his wife would allow a man to die instead of facing justice. Their relationship becomes frayed as Mockingbird leaves the West Coast Avengers and separates from Hawkeye. Hawkeye is challenged to a duel to the death by his former mentor Trick Shot. Hawkeye reluctantly accepts the challenge and wins. Trick Shot reveals that he is dying of cancer and wants to die honorably in battle. Hawkeye, instead of granting his former mentor's wish, promises to fund his medical care. Later, when Crossfire places a bounty on Hawkeye's right arm, Trick Shot (whose cancer had gone into remission) returns to aid his former pupil. Along with Mockingbird, the two archers defeat an army of supervillains looking to lay claim to the bounty. After this altercation with Crossfire, Hawkeye tells Mockingbird that he was wrong to blame her for what happened with the Phantom Rider. The pair soon reconcile. After being shot while confronting criminals, Hawkeye adopts an armoured version of his costume to battle the gangs of Los Angeles. The West Coast Avengers are then caught in the middle of a supernatural battle between Mephisto and Satannish. The team are able to defeat the two demons and force them back to their own realms. However, Mephisto retaliates by firing energy blasts at the escaping West Coast Avengers. Mockingbird sacrifices herself to save Hawkeye and dies in her husband's arms. Embittered by Mockingbird's death, Hawkeye leaves the team, which is disbanded almost immediately afterwards. Hawkeye isolates himself in the Canadian Rockies to separate himself from the world. He is soon forced to battle the Secret Empire. He manages to defeat Viper, the leader of the Secret Empire, and her hired supervillains, Javelynn and his old mentor Trick Shot. Hawkeye returns to the Avengers just prior to the battle with the entity Onslaught, in which the Avengers (including Hawkeye) are apparently killed. Franklin Richards, however, transported them all to a pocket universe where the heroes led altered lives. The heroes eventually learned the truth and they were returned to their own universe. Hawkeye's hearing was fully restored because, when Franklin Richards recreated the heroes in the new universe, he based them on how he remembered them. Hawkeye remains with the Avengers for numerous adventures. He aids Avenger trainees Justice and Firestar to defeat the Taskmaster and Albino. Hawkeye later resigns the Avengers to assume leadership of the first generation of the Thunderbolts, who had broken away from the influence of Baron Helmut Zemo. Hawkeye trains the team in the fashion of former teammate Captain America, and shapes the team into a cohesive fighting unit. The Thunderbolts take on threats like the Masters of Evil, Graviton, and the Scourge of the Underworld. Hawkeye begins a romantic relationship with fellow Thunderbolts member Moonstone, who Hawkeye is proving to be a good influence on. Later, Hawkeye and the Thunderbolts travel to Hell to save the soul of Mockingbird. They defeat the demonic Mephisto, but Hawkeye is unable to find his wife. To ensure that his Thunderbolts are given full pardons, Hawkeye allows himself to be arrested in their place. The Thunderbolts' past crimes are erased on the condition that they retire from costumed heroics. The team reluctantly agrees. Later, when Hawkeye had gotten out of prison, the team comes back together to defeat Graviton once again. Convinced that they are ready to be heroes in their own right, Hawkeye hands leadership of the Thunderbolts to Citizen V (whose mind was actually under the control of Baron Helmut Zemo) and leaves the team. Hawkeye joins the Avengers once more, and begins a brief romantic relationship with team member the Wasp. He also embarks on some solo adventures where he uncovers a plot to steal an ancient artifact in Laos, and investigates the murder of a former Soviet colonel. The Scarlet Witch, driven mad by her powers, causes a Kree warship to appear over the skies of New York. The Avengers, surprised by the appearance of the spacecraft, spring into battle. During the battle, Hawkeye's quiver of arrows is set on fire. Knowing that the explosive arrows were going to blow faster than he could remove them, Hawkeye flies into the engines of the Kree warship, destroying the spacecraft and sacrificing himself to save his teammates. A past version of Hawkeye is also plucked from time by the Time Variance Authority to serve as a juror in a case involving former Avengers teammate She-Hulk. She-Hulk tries unsuccessfully to warn Hawkeye as to his future. When the Scarlet Witch inadvertently alters reality, Hawkeye is resurrected with no memory of previous events. When a young mutant named Layla Miller gives several heroes (including Hawkeye) the ability to remember, he is horrified at the Scarlet Witch's actions. Hawkeye shoots Wanda in the back with an arrow. In retaliation, one of her recreated children wipes Hawkeye from existence, killing him once more. When the Scarlet Witch's reality is eventually undone, Hawkeye is still presumed dead. However, the recently formed New Avengers find his bow and arrows on the site of the old Avengers Mansion, pinning up an article about his death. Unknown to the New Avengers, Hawkeye is resurrected once reality was restored. He seeks out Doctor Strange, who offers Hawkeye shelter while he comes to terms with his new life. Against the advice of Dr. Strange, Hawkeye eventually travels to Wundagore Mountain and finds the Scarlet Witch living a normal life with no memory of her past and apparently without mutant abilities. The two become intimate and Hawkeye then leaves Wanda to her normal life. Returning to the United States, Hawkeye learns about the assassination of Captain America. He confronts Tony Stark, who then offers Hawkeye the Captain America shield and costume to continue the legacy. Hawkeye is later inspired by the words of Kate Bishop, whom he met while hiding his identity, and rejects Stark's offer. Hawkeye returns to see Dr. Strange and meets the New Avengers. The team invites Hawkeye to join the team. Hawkeye accepts, and accompanies the team on a mission to Japan to rescue Echo. However, leaving behind his Hawkeye identity, Clint Barton takes on the disguise of Ronin. Echo, the original Ronin, later gives Barton her blessing to adopt her old identity. Clint later meets Kate Bishop again, but this time reveals his true identity, much to Kate's surprise. Impressed with Kate's skill with a bow, and the fact she reminds him of himself at her age, Clint blesses Kate to continue using the Hawkeye codename. Clint (as Ronin) was part of the New Avengers team that head to the Savage Land after a tip from Spider-Woman that a Skrull ship had crash landed there. Emerging from the crashed ship was a selection of heroes claiming to have been abducted, one of which was Mockingbird. Clint believes that she is the real Mockingbird until Mister Fantastic's invention proves that the heroes from the Skrull ship were all imposters. Later, after the war for Earth was won, Clint is reunited with the real Mockingbird, who was revealed to have been held captive by the Skrulls for years. Clint Barton as Ronin on a variant cover of Dark Reign: The List - Avengers #1 (September 2009). Art by Marko Djurdjević. Clint attempts to help Mockingbird as she tries to adapt to life back on Earth. He accompanies her to Zaragoza, Spain, to battle Monica Rappaccini and the hordes of A.I.M. in an effort to deactivate a "dirty bomb" designed by the evil scientific group. Despite their years apart, Clint and Mockingbird battle with comfort and understanding. They manage to defeat A.I.M. and foil their evil plot. At the conclusion of the Skrull war, S.H.I.E.L.D. is dissolved and Norman Osborn is placed in power of national security. Osborn creates his own team of villainous Avengers by stealing the costumed identities of previous Avengers. The supervillain assassin Bullseye joins the team and takes on the mantle of Hawkeye. Watching the Avengers news coverage on television with the rest of the New Avengers, Clint is stunned to see the events taking place. Clint unmasked himself on network television and publicly denounces Norman Osborn and his regime. He is later elected as the leader of the New Avengers and makes toppling Osborn and the Hood from power his number one priority. Clint argues that the only way to beat Osborn is to kill him, although the rest of the team disagrees. Clint attempts to storm Avengers Tower single-handedly to achieve his goal. He defeats the Dark Avengers, but is captured and arrested when, after failing to kill Norman Osborn, he is attacked from behind by Ares. Clint was imprisoned and tortured at the hands of Mentallo. He was later freed by his teammates, and apologized for his actions. Clint aids Captain America, Falcon and Black Widow as they battle the Red Skull and his henchmen to rescue Sharon Carter and the time-displaced Steve Rogers. Captain America later leads the New Avengers (including Clint) against Norman Osborn's forces as they attempted to lay siege to Asgard. After the events of Siege, Steve Rogers puts together a new team of Avengers. Clint joins the team and returns to his Hawkeye identity (although he encourages Kate Bishop to keep the Hawkeye identity as well). He and Mockingbird are also members of the New Avengers, although Hawkeye later leaves the New Avengers when he receives an Avengers priority call from the main team, claiming that he was only there to spend time with his wife. Hawkeye aids Mockingbird and her anti-terrorist organization, the World Counter-terrorism Agency. Together, they thwart Crossfire's illegal arms operation, and encounter Lincoln Slade's descendant, Jaime Slade, who later goes onto become the new Phantom Rider. Crossfire and the new Phantom Rider team-up to battle the heroes. This feud has its casualties with Mockingbird's mother being severely wounded and the death of Hamilton Slade, both at the hands of Crossfire. Hawkeye leaves the W.C.A. after it becomes clear that his relationship with Mockingbird has become too strained. However, he quickly rejoins after being informed by Steve Rogers that a kill list of international spies includes Mockingbird. Hawkeye and Mockingbird team up with the Black Widow to take on the mysterious new Ronin and the Dark Ocean Society. The new Ronin is later revealed to be Alexei Shostakov, the former Red Guardian and ex-husband of the Black Widow. During the final battle with the new Ronin, Hawkeye receives a strong blow to the head. When the battle is won, he assures Mockingbird and Black Widow that he suffered no ill effects from the blow. The blow to the head that Hawkeye received proves to be more serious than first thought. While battling the Lethal Legion with the Avengers, Hawkeye's aim is shown to be faltering. After the battle, Tony Stark, Donald Blake and Steve Rogers examine Hawkeye to discover what is causing it. Their diagnosis is that Hawkeye is steadily losing his sight and will soon go blind. Iron Man provides Hawkeye with technology that should stall the blindness. Later, Trick Shot arrives at Avengers Tower on the brink of death. Trick Shot tells Hawkeye that he was forced to train another archer, one who was as good as Hawkeye, before dying in his arms. Hawkeye was later ambushed by his brother Barney (who was revealed to have been the one trained by Trick Shot) who now goes by the name Trickshot. Barney manages to subdue Hawkeye and bring him to Baron Zemo. Baron Zemo had the brothers duel to the death. Hawkeye (despite going blind from a previous injury with the third Ronin) managed to best Trickshot in battle. Before teleporting away, Baron Zemo transferred Trickshot's criminal funds over to the "victor" Hawkeye, then taunted the hero for turning his brother against him. In custody, Trickshot agreed to a bone marrow transplant to save his brother's sight, but only so he could battle Hawkeye again in the future. Hawkeye displaying his redesigned costume on the cover of Hawkeye Vol. 4 (2012) #2. Art by David Aja. Following the Fear Itself storyline, the Avengers Academy is reopened in Palos Verdes at the former West Coast Avengers headquarters, where Barton accepts an offer to become a teacher. The character receives a new costume in Avengers vol. 4, #19 (November 2011). Cullen Bunn, writer of Captain America & Hawkeye, stated the costume was influenced slightly by The Avengers. In 2012, Hawkeye becomes the leader of the Secret Avengers. The 2012 critically acclaimed Hawkeye vol 4 solo series, focuses on Hawkeye defending an apartment building from the Russian mob with the assistance of Kate and his brother Barney. Hawkeye became a member of the New Avengers led by Sunspot at the request of S.H.I.E.L.D., who are suspicious of Sunspot's activities and want Clint to spy on them. However, during a conflict, Hawkeye is fired from S.H.I.E.L.D. due to deciding to side with the New Avengers against them and following Songbird's betrayal of the team as a S.H.I.E.L.D. double agent. During the Civil War II storyline, Hawkeye shoots Bruce Banner in the head with an arrow in light of Ulysses' vision of a rampaging Hulk standing over the corpses of the dead superheroes. During the Avengers-presided trial, Hawkeye stated that Bruce Banner approached him and asked for Hawkeye to kill him if he ever became Hulk again. He is acquitted of all charges and his actions heavily divided the superhero community in the Ulysses conflict. After Civil War II, Clint starts traveling the country and focuses his efforts towards helping the underprivileged with community based problems in an effort to redeem his actions from the event, beginning with the water supply in Santa Rosa. He eventually gains the aid of the Red Wolf of Earth-51920 to help him fight for those who cannot defend themselves. After Captain America leads Hydra's takeover of the United States as part of the "Secret Empire" storyline, Hawkeye is one of the leaders for the few free heroes left in the country (others are either trapped outside Earth's atmosphere, trapped in New York behind a Darkforce shield, or working with Hydra). After Rick Jones is able to send information to the heroes revealing that Captain America has been "brainwashed" by the Cosmic Cube Kobik to believe that he has been a Hydra agent since childhood, Hawkeye is one of the heroes favoring the idea that they can recover the fragmented cube and use it to restore Rogers to normal, in opposition to the Black Widow's plan to just kill Rogers and stop him. Despite their opposing viewpoints, Hawkeye falls back in love with Black Widow and is devastated by her supposed death at the hands of the evil Steve Rogers. Shortly after Natasha's supposed death, a number of her enemies have been killed off. Hawkeye and Winter Soldier start investigating the trail of bodies left behind to uncover the mysterious assassin and determine if Black Widow is still alive. They eventually discover that she was cloned by the Black Widow Ops Program following her death. When Winter Soldier and Hawkeye arrived at the Red Room, the Black Widow clone dropped her cover where she began to kill her superiors, liberate the recruits, and destroy all the clones and Epsilon Red. When the authorities arrived, Black Widow left the Red Room where she left a note for Hawkeye to stop following her and for Winter Soldier to join her in ending the Red Room. During the Fresh Start relaunch, Clint and Kate decided to revive the West Coast Avengers following an attack by land sharks in Santa Monica. For that, they recruited America Chavez and Kate's boyfriend Johnny "Fuse" Watts, who helped in the mission, and were eventually joined by Gwenpool and Kid Omega. Given their lack of funds, the newly formed team tried to get financers by starring in a reality show following their exploits. While Hawkeye has no superhuman powers (with the exception of the period when using Pym particles to become Goliath), he is at the very peak of human conditioning. He is an exceptional fencer, acrobat and marksman, having been trained from childhood in the circus and by the criminals Trick Shot and Swordsman. This includes considerable strength, as a supervillain found out when he tried to use the superhero's 250 pounds-force (1,100 newtons) draw-weight bow and found that he could not draw back the string to launch an arrow. Hawkeye is also known to use a "Sky-Cycle" as his mode of transportation. The Sky-Cycle is modelled after a commercial snowmobile and is fitted with anti-gravitational technology. It is voice-operated and has an auto-pilot steering system. The original Sky-Cycle was custom made for Hawkeye by Jorge Latham while he was employed by Cross Technological Enterprises. Latham was later employed by the West Coast Avengers and built several more. Hawkeye (right) as he appears in The Avengers: Earth's Mightiest Heroes. Hawkeye appears in the animated television series The Marvel Super Heroes (1966), voiced by Chris Wiggins. Hawkeye appears as a regular character in Iron Man, voiced by John Reilly. Hawkeye has a brief cameo as Goliath in the Fantastic Four episode "To Battle the Living Planet". Hawkeye appears in The Avengers: United They Stand, voiced by Tony Daniels. Hawkeye is featured in The Super Hero Squad Show, voiced by Adrian Pasdar. Hawkeye appears in The Avengers: Earth's Mightiest Heroes, voiced by Chris Cox. Hawkeye appears in the Iron Man: Armored Adventures episodes "The Hawk and the Spider", "Iron Man 2099", "The Makluan Invasion part one: Annihilate! ", and "The Makluan Invasion part two: Unite! ", voiced by Andrew Francis. Hawkeye appears in the Ultimate Spider-Man, voiced by Troy Baker. He appears in the season 2 episode "Hawkeye", and in the season 3 episodes "The Avenging Spider-Man (Parts 1 and 2)," "S.H.I.E.L.D. Academy," "Burrito Run," "Nightmare on Christmas" and "Contest of Champions (Parts 3 and 4)." Hawkeye appears in Avengers Assemble, reprised by Troy Baker. Hawkeye appears as a recurring character in Marvel Disk Wars: The Avengers, voiced by Eiji Takemoto. Barton will be featured in the untitled live-action Hawkeye series that will premiere on Disney+ with Jeremy Renner reprising his role as he will pass the Hawkeye mantle to Kate Bishop. Mockingbird and Hawkeye's son Francis appears in the animated feature film Next Avengers: Heroes of Tomorrow. Hawkeye led a resistance against Ultron until his death at Ultron's hands resulting in Francis taking the mantle and position of his father. Hawkeye appears in the anime film Iron Man: Rise of Technovore, reprised by Troy Baker. Hawkeye appears in the anime film Avengers Confidential: Black Widow & Punisher, voiced by an uncredited Matthew Mercer. Jeremy Renner portrays Hawkeye in the Marvel Cinematic Universe films. He makes an uncredited cameo appearance in the 2011 live-action film Thor. Renner reprises the role in 2012's The Avengers, 2015's Avengers: Age of Ultron, and 2016's Captain America: Civil War. He was initially to appear in a fight scene with Captain America in Captain America: The Winter Soldier (2014) but it was scrapped due to his other filming commitments. Renner initially said he would appear in Avengers: Infinity War, but did not make the theatrical cut. During the events of that film, he is mentioned, along with Scott Lang, as being under house arrest. He will appear in 2019's Avengers: Endgame. Barton has a new outfit in the film, visually similar to that of Ronin from the comics. Hawkeye is a playable character in the video game Spider-Man: The Video Game. Hawkeye is a playable character in Captain America and the Avengers. Hawkeye appears as a support character in Venom/Spider-Man: Separation Anxiety. Evil clones of Hawkeye appear as enemies in Marvel Super Heroes In War of the Gems. Hawkeye appears as a playable character in the PSP version of Marvel: Ultimate Alliance, voiced by Nolan North. He also appears in the Xbox 360 downloadable "Heroes and Villains" version. Hawkeye is a playable character in the crossover fighting game Ultimate Marvel vs. Capcom 3, with Chris Cox reprising his role from The Avengers: Earth's Mightiest Heroes. Hawkeye is a playable character in Marvel Super Hero Squad Online, voiced by Sam Riegel. Hawkeye is a playable character in the Facebook game Marvel: Avengers Alliance. Hawkeye appears as a playable character in the 2012 fighting game Marvel Avengers: Battle for Earth, voiced by Troy Baker. Hawkeye is available as downloadable content for the game LittleBigPlanet, as part of "Marvel Costume Kit 6". Hawkeye is a playable character in the MMORPG Marvel Heroes. Chris Cox again reprises the role. Hawkeye is a playable character in Lego Marvel Super Heroes, voiced by Troy Baker. Hawkeye is a playable character in the 2014 iOS game Marvel: Contest of Champions. Hawkeye is a playable character in Marvel Avengers Alliance Tactics. Hawkeye appears in Disney Infinity: Marvel Super Heroes and Disney Infinity 3.0, with Troy Baker reprising his role. Hawkeye is a playable character in Marvel: Future Fight. Hawkeye is a playable character in Lego Marvel's Avengers, voiced by Jeremy Renner. A teenage version of Hawkeye appears in Marvel Avengers Academy, voiced by Gustavo Sorola. There are four playable versions of Clint Barton as Hawkeye in the match-three mobile game Marvel Puzzle Quest, the two newest versions of which are due to be added to the game in March 2017. Hawkeye appears as a playable character in Marvel vs. Capcom: Infinite, voiced again by Chris Cox. Hawkeye appears as a playable character in Marvel Powers United VR, voiced again by Chris Cox. Hawkeye appears as a member of the Avengers in the Marvel Universe: LIVE! stage show. Hawkeye was ranked as the 45th Greatest Comic Book Character of All Time by Wizard magazine. IGN also ranked Hawkeye as the 44th Greatest Comic Book Hero of All Time opining that only it takes a special kind of hero to parade around in blue and purple and battle deadly villains with nothing more than a satchel of arrows and only Hawkeye can successfully pull it off, and as #9 on their list of "The Top 50 Avengers" in 2012. In 2013, ComicsAlliance ranked Hawkeye as #27 on their list of the "50 Sexiest Male Characters in Comics". The fourth volume of Hawkeye has received favorable reviews for its focus on what Hawkeye does when he's not an Avenger, playing up his status as the "everyman" on the team. Praising the series in an article titled, "How did Hawkeye become Marvel's best comic? ", The A.V. Club wrote, "Spider-Man has long been considered Marvel's superhero everyman, but Hawkeye has stolen that title with this series." Comics Alliance's Chris Sims summarized it as, "For (Hawkeye), everything that happens in the book is a pain, but it's something he deals with because he wants to help the people around him, to the degree that he's driven to do so even on his days off from literally saving the world." In 2013, Hawkeye was nominated for five Eisner Awards, winning two: Best Cover Artist and Best Penciler/Inker, and nominated for seven Harvey Awards, winning one. In 2014, Hawkeye was nominated for five Eisner Awards, winning two, and nominated for five Harvey Awards, winning one. One of the series' most well received issues was the "Pizza Dog" issue (No. 11), which is told from the perspective of Barton's dog, Lucky. Wired Magazine said of the issue, "The conceit is a high-concept, high-wire act for a comic to carry off, but Fraction and Aja stick the landing with a poise and grace that deserves full marks ... It manages to be both a functional murder mystery loaded with noir sensibilities – from the bloody paw prints that blot across the cover to a rooftop gun scuffle with neighborhood thugs – and a book that is as entertaining as it is experimental and worth reading a time or ten." In 2012, the mother of 4-year-old Anthony Smith contacted Marvel because her son would not wear his hearing aid, as superheroes do not have to. Marvel responded with a custom comic book of the superhero Blue Ear for Anthony, and also pointed out that for years Hawkeye was deaf and used hearing aids. ^ "Top 100 Comic Book Heroes - IGN". Retrieved 27 September 2012. ^ DeAngelo, Daniel (July 2013). "The Not-Ready-For-Super-Team Players: A History of the Defenders". Back Issue!. TwoMorrows Publishing (65): 5. ^ Richards, Dave (14 October 2012). "NYCC: Spencer's "Secret Avengers" are the Newest Agents of S.H.I.E.L.D." Comic Book Resources. Archived from the original on 27 September 2013. Retrieved 15 October 2012. ^ Stevens, Tim (13 April 2012). "C2E2 2012: Hawkeye". Marvel.com. Retrieved 30 January 2013. ^ Pepose, David. "SDCC 2016: Marvel NOW! - 'Divided We Stand' Panel". Newsarama. ^ "Marvel's 'Hawkeye' Writer Explains Kate Bishop's Journey to the West Coast". EW.com. ^ Arrant, Chris (December 20, 2017). "HAWKEYE & ICEMAN Join Wave of MARVEL Titles Canceled". Newsarama. Retrieved January 3, 2018. ^ Sunu, Steve (2012-01-11). "Cullen Bunn on "Captain America & Hawkeye"". Comic Book Resources. Retrieved 2012-01-17. ^ "Farewell, Bro: How Matt Fraction and David Aja's 'Hawkeye' changed Marvel Comics". EW.com. ^ Gruenwald, Mark; Layton, Bob (1983). "Till Death Do Us Part". Hawkeye. 1 (4). ^ Bush, Jenna (February 8, 2010). "AVENGERS Animated Assembling w/ Phil Lamarr". Newsarama. Retrieved September 7, 2010. ^ Rich Sands (20 December 2012). "Disney XD's Ultimate Spider-Man Swing Back Into Action in 2013". TVGuide.com. ^ "NYCC: Marvel to Premiere Avengers Assemble & Agents of S.M.A.S.H. Next Summer". SuperHeroHype. ^ Otterson, Joe; Otterson, Joe (2019-04-10). "Hawkeye Series Starring Jeremy Renner in the Works at Disney+ (EXCLUSIVE)". Variety. Retrieved 2019-04-10. ^ "Marvel and Sony Announce New IRON MAN Animated Feature". Newsarama.com. ^ "Cinema Con: We've Seen Hawkeye In Thor And It's More Than A Walk On". CinemaBlend. 2011-03-28. Retrieved 2011-03-28. ^ Lussier, Germain (July 24, 2010). "SDCC 2010: Marvel Studios Officially Announces Mark Ruffalo and Jeremy Renner for THE AVENGERS; Surprises With Full Cast at Comic-Con!". Collider. Retrieved August 6, 2010. ^ "Tom Hiddleston Cheers On James Spader In The Avengers: Age Of Ultron". cinemablend.com. ^ Kit, Borys (March 6, 2015). "Jeremy Renner Joins Amy Adams in 'Story of Your Life'". The Hollywood Reporter. ^ "Interview: Anthony and Joe Russo on The Winter Soldier, Captain America 3 and Agent Carter". Superhero Hype. 2014-09-01. Retrieved 2014-09-01. ^ "Hawkeye's Cut Sequence in 'Captain America 2′ Revealed". Screen Rant. 2014-09-01. Retrieved 2014-09-01. ^ a b Stern, Marlow (September 29, 2014). "Jeremy Renner Opens Up About Marriage, His Problems with the Media, and the Future of Hawk-Eye". The Daily Beast. Archived from the original on June 25, 2015. Retrieved June 24, 2015. ^ a b Ricwulf, Daniel (October 24, 2015). "Jeremy Renner & Michael Douglas Hint At Marvel Team-Up". Screen Rant. Archived from the original on October 26, 2016. Retrieved October 25, 2016. ^ Goldberg, Matt (April 28, 2018). "'Avengers: Infinity War': Where's Hawkeye?". Collider. Retrieved May 8, 2018. ^ Downey, Meg (2018-12-07). "Who Is Ronin? Hawkeye Returns In Avengers Endgame Trailer With A New Look". Gamespot. Retrieved 2018-12-08. ^ Goldstein, Hillary (November 11, 2009). "Marvel: Ultimate Alliance Review (PSP)". IGN. Retrieved September 7, 2010. ^ "Marvel Costume Kit 6". Sony. Archived from the original on January 10, 2013. Retrieved January 10, 2013. ^ "Hawkeye joins Marvel Heroes". Marvel Heroes. 2012-05-31. Retrieved 2012-07-19. ^ "Piecing Together Marvel Puzzle Quest: Hawkeye - News - Marvel". Marvel Entertainment. ^ Hussain, Tamoor (April 25, 2017). "Marvel Vs. Capcom: Infinite Release Date And New Characters Revealed". GameSpot. CBS Interactive. Retrieved April 25, 2017. ^ "Character Reveals for Marvel Universe LIVE! - News - Marvel.com". marvel.com. ^ "Hawkeye is number 44". IGN. Retrieved May 19, 2011. ^ Sava, Oliver (7 Dec 2012). "How did Hawkeye become Marvel's best comic?". The A.V. Club. Retrieved 3 June 2014. ^ Sims, Chris (1 August 2012). "Matt Fraction and David Aja's 'Hawkeye' #1: The Avenger Who's Just A Dude". Comics Alliance. Archived from the original on 6 June 2014. Retrieved 30 January 2013. ^ Hughes, Joseph (16 April 2013). "Eisner Awards 2013: 'Building Stories' & 'Fatale' Sweep Nominations, ComicsAlliance Gets A Nod". Comics Alliance. Archived from the original on 6 June 2014. Retrieved 3 June 2014. ^ "2013 EISNER Awards Winners (Full List)". Newsarama. 20 July 2013. Retrieved 3 June 2014. ^ "Your 2013 Harvey Awards Winners". Comics Reporter. 8 September 2013. Retrieved 3 June 2014. ^ "Eisner Awards: 'Hawkeye,' 'The Wake,' 'Saga' lead nominations field". LA Times. 15 April 2014. Retrieved 3 June 2014. ^ "2014 Eisner Awards: Full List Of Winners And Nominees". Comics Alliance. 26 July 2014. Archived from the original on 6 October 2014. Retrieved 28 July 2014. ^ Sims, Chris (16 July 2014). "Harvey Awards Announces 2014 Nominees, Congratulations In Advance To 'Hawkeye' #11". Comics Alliance. Archived from the original on 6 October 2014. Retrieved 18 July 2014. ^ "2014 Harvey Award Winners Announced". Previews World. Retrieved 22 September 2014. ^ Hudson, Laura (27 June 2013). "The Best Superhero Comic of the Year Is About a Crime-Solving Dog Who Loves Pizza". Wired. Retrieved 3 June 2014. ^ "Marvel Comics creates superhero in honor of NH boy". MyFoxBoston. 2012-05-22. Retrieved 2012-08-13. ^ "Current Amazon release date". Retrieved 2014-08-11. ^ "Current Amazon release date". Retrieved 2015-04-22.